Believe it or not, it has been nine long months since the launch of Bing. Microsoft launched the successor to MSN Live Search amid a blaze of publicity in June 2009. At the time, Microsoft insisted it would shake up the search engine market by providing more accurate results than ever before. 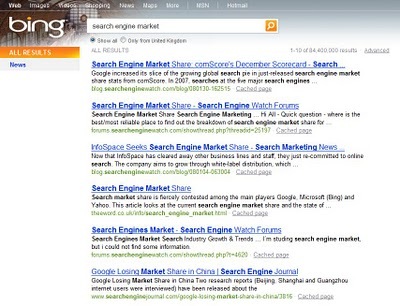 Bing was carefully positioned as a "decision engine", not a search engine. In truth, it has been a turbulent few months for Bing. A rumoured £60.89 million marketing budget and rave reviews made it the early adopters' site of choice in the early days. However, progress seemed to stall towards the end of 2009 with research even suggesting it was losing users. Since the turn of the year, however, things seem to be looking up for Bing. This week, digital marketing specialist comScore published its eagerly awaited US core search rankings index. It showed that Microsoft's share of the American search engine market rose 0.2 per cent in February 2010. Now that may not sound like a lot, but it's pretty impressive growth in a single month. Perhaps more important was the revelation that Google's share only rose 0.1 per cent – so Microsoft is catching up, albeit painfully slowly. For the record, Microsoft's share now stands at 11.5 per cent while Google is sitting pretty on 65.5 per cent. But that wasn't the only good piece of news for Microsoft. Fellow digital marketing specialist Hitwise also released figures this week, showing that Bing has increased its slice of the pie for the third straight month. Microsoft's share of the US search engine market grew by a hugely impressive 0.33 per cent in February 2010 while Google dropped by 0.54 per cent. According to Hitwise, Google now accounts for 70.95 per cent of the industry, while Bing has 9.7 per cent. So what is going on? One explanation is that Google has been hit by a barrage of bad publicity in 2010. The Nexus One was criticised for a lack of ambition by many smartphone experts. Meanwhile, privacy complaints have dogged the launch of its social network Buzz. And the European Commission has decided to investigate whether Google's search engine results and PPC models are anti-competitive. Another explanation is that Bing is doing a better job of getting its message across. This week saw the launch of a major new UK TV and online ad campaign to promote the quality of Bing's results. Microsoft is clearly still willing to throw resources behind the site. The final explanation is the simplest of all. Perhaps Bing is growing because people just prefer using it.